I just realized it has been a week since I posted anything. I wish I could say I was just being lazy, but that isn't the case. We finished cutting back all the gardens this past weekend and raked the last of the leaves which blew from Hurricane Sandy. At my place of employment we have been gathering cleaning supplies for those affected by the storm ... gallons of bleach, disinfectant wipes, rubber gloves - anything to help them with cleaning up their homes. I can't imagine how these people are coping with the emotional aftermath. Making a donation to the Red Cross and purchasing supplies doesn't quite seem like enough. Well, enough of the sadness. Today I have a Christmas card to share with you using a little tinsel. These colors remind me of a snowy winter night. On a piece of Shimmery White paper cut from a Spellbinders Labels Four #5 die, the Heart of Christmas image was inked in VersaMark and embossed with silver embossing powder and a heat gun. I layered the image onto a Labels Four small cut from Bashful Blue paper. 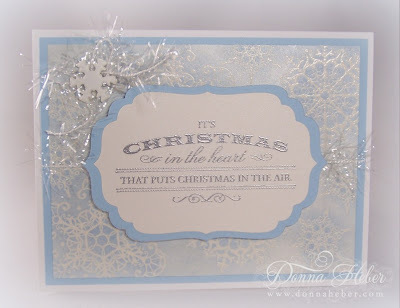 The background was created by randomly stamping snowflakes on a piece of Shimmery White paper using VersaMark and embossing them with clear embossing powder. Using a light touch I sponged the background with Brilliance Platinum Planet & Bashful Blue and watched as the snowflakes appeared. This technique is called emboss resist. I found a roll of tinsel trim in my stash. Perfect for adding a little bling without the mess! A piece was wrapped around the center of the card. Next, I made a little bow and fastened it with a white snowflake brad. 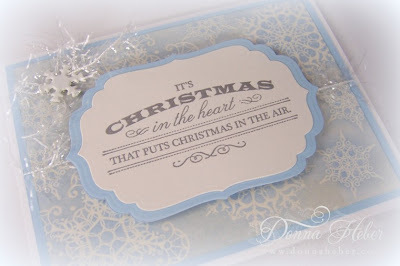 The inside sentiment was stamped in VersaMark and embossed with silver embossing powder. The snowflakes were done the same as the background on the front of the card. As Thanksgiving approaches I'm getting ready to pull out my Christmas decorations. There seems to be so much to do in such a short amount of time. Have you started your holiday shopping yet? Are you waiting for Black Friday? Sounds like you've been busy! We're back too but also still busy. Hope you have a good holiday runup and that it's not too cold. yes it must be so traumatic for the people caught up in Sandy Every little you can do is a wonderful help. very beautiful and elegant christmas card Donna. Beautiful card! I love the bit of bling you added too! I know I am thinking of the victims of the hurricane too. I don't think I can fully appreciate what they must be going thru. My prayers are with them! This is an elegant beautiful card. I love it! I love this card. It looks absolutely gorgeous with the tinsel, silver embossing and blue. That's a gorgeous card! I love the colors. I haven't started holiday shopping but that's not unusual for me. I wait til the last minute! What a beautiful Christmas card - love all the embossing! A very elegant card. I love the beautiful colour combination and the added tinsel. First Sandy and now floods here in Italy, the world weather is in turmoil. So pretty Donna. I love the background you created. Pretty card, Donna! Yes, I've bought a few Christmas gifts, but still not sure what I need for everyone. Have to put a list together! Black Friday-Never! Do you go out on Black Friday? Such a pretty CAS style card, I noticed you haven't put in a link to MIM could you please add it. Thanks. What a serene and beautiful Christmas card. I love the blue with the silver tinsel. Gorgeous!